Objective To assess the effects of use of cannabis during pregnancy on maternal and fetal outcomes. Data sources 7 electronic databases were searched from inception to 1 April 2014. Studies that investigated the effects of use of cannabis during pregnancy on maternal and fetal outcomes were included. Study selection Case–control studies, cross-sectional and cohort studies were included. Data extraction and synthesis Data synthesis was undertaken via systematic review and meta-analysis of available evidence. All review stages were conducted independently by 2 reviewers. Main outcomes and measures Maternal, fetal and neonatal outcomes up to 6 weeks postpartum after exposure to cannabis. Meta-analyses were conducted on variables that had 3 or more studies that measured an outcome in a consistent manner. Outcomes for which meta-analyses were conducted included: anaemia, birth weight, low birth weight, neonatal length, placement in the neonatal intensive care unit, gestational age, head circumference and preterm birth. Results 24 studies were included in the review. Results of the meta-analysis demonstrated that women who used cannabis during pregnancy had an increase in the odds of anaemia (pooled OR (pOR)=1.36: 95% CI 1.10 to 1.69) compared with women who did not use cannabis during pregnancy. Infants exposed to cannabis in utero had a decrease in birth weight (low birth weight pOR=1.77: 95% CI 1.04 to 3.01; pooled mean difference (pMD) for birth weight=109.42 g: 38.72 to 180.12) compared with infants whose mothers did not use cannabis during pregnancy. Infants exposed to cannabis in utero were also more likely to need placement in the neonatal intensive care unit compared with infants whose mothers did not use cannabis during pregnancy (pOR=2.02: 1.27 to 3.21). Conclusions and relevance Use of cannabis during pregnancy may increase adverse outcomes for women and their neonates. As use of cannabis gains social acceptance, pregnant women and their medical providers could benefit from health education on potential adverse effects of use of cannabis during pregnancy. Anaemia was the most widely discussed maternal outcome in the cannabis-pregnancy literature. Women who used cannabis during pregnancy may have an increase in the odds of anaemia compared with women who did not use cannabis during pregnancy. Infants exposed to cannabis in utero had decreased birth weight and were more likely to need placement in the neonatal intensive care unit or intensive care unit compared with infants whose mothers did not use cannabis during pregnancy. Many cannabis users are often tobacco or alcohol users; hence, determining a cannabis-only effect (excluding the presence of tobacco and alcohol) was currently not possible, as most studies did not exclude participants with polysubstance use. Future research in the area of cannabis and maternal and fetal health needs to exclude polysubstance use. Very few outcomes were measured using the same cut-offs across multiple articles; therefore, few variables included here could be clearly interpreted. Additionally, many studies reported unique maternal and fetal outcomes not reported in other studies; therefore, definitive conclusions could not be drawn. Reliance on self-reported measures of use of cannabis, may have underestimated the prevalence of drug use during pregnancy due to social desirability. Historically, cannabis was of little concern to public health officials. However, recent reports indicate an increase in adverse health outcomes linked to regular use of cannabis that include: motor vehicle accidents, drug-induced psychotic symptoms and psychotic disorders, HIV, hepatitis B and C, infective endocarditis, and tuberculosis.3 Also, between 2003 and 2012, an increase in the proportion of cannabis-related admissions to substance abuse treatment services was demonstrated in Western and Central Europe (from 19% to 25%), Eastern and South-Eastern Europe (from 8% to 15%), Latin America and the Caribbean (from 24% to 40%), and Oceania (from 30% to 46%).2 In Africa, cannabis contributed 60% of the proportion of treatment admissions due to illicit drugs.4 With recent reports indicating widespread use of cannabis, questions have been raised about the extent to which cannabis may affect maternal health and fetal development. There is a paucity of well-designed studies that assess the effects of prenatal exposure to cannabis on maternal and fetal health outcomes.5 More importantly, the results of the few available studies are often conflicting, and conclusions are complicated because studies often include participants with polysubstance use. The effects of in utero exposure to other illicit drugs, such as cocaine, have been widely studied; however, less is known about the effects of cannabis on fetal growth and development, or its effects on pregnant women. This paper summarises, and critically appraises, existing literature on the effects of prenatal exposure to cannabis on women and their neonates. The data summarised here may be useful in guiding policy, practice and future research on the benefits and harms associated with use of cannabis during pregnancy. As use of cannabis gains social acceptance, pregnant women and their medical providers could benefit from health education on potential adverse effects of use of cannabis during pregnancy. We searched the following databases from inception to 1 April 2014: PubMed/MEDLINE, Ovid/MEDLINE, CINAHL/EBSCO, PsychInfo/EBSCO, Web of Science, Sociological Abstracts and EMBASE. A broad range of keywords that focused on cannabis and maternal, fetal, perinatal and neonatal outcomes were used to search each database (see online supplement 1). These keywords were first established in PubMed and then formatted to each individual database in an attempt to find a range of articles from a variety of different fields. In addition, all references and review articles were hand searched for other potentially relevant articles. Finally, in order to ascertain if there were any applicable unpublished or ongoing details of the studies assessed, we attempted to contact the lead author of each study included in this manuscript. As previously stated in the study protocol,6 randomised controlled trials, case–control, cross-sectional and cohort studies that investigated the effects of prenatal use of cannabis on maternal, fetal, perinatal and neonatal outcomes were eligible for inclusion in this systematic review. Studies must have included data on women who used cannabis during pregnancy. In order to rule out effects of other illicit drugs (eg, cocaine, methadone), only studies that reported outcomes of prenatal use of cannabis while excluding other illicit substances were included in this study. Owing to low numbers of studies that account for concurrent cannabis, alcohol and tobacco use, studies reporting outcomes of in utero exposure to cannabis in the presence of smoking tobacco and consuming alcohol were included. Maternal outcomes included those occurring during pregnancy or directly following delivery. Infant outcomes included those measured prenatally until 6 weeks postpartum. Owing to the large number of studies available, only studies published in English were included. Participants were pregnant women who used cannabis during pregnancy but abstained from all other illicit drug use (eg, cocaine, barbiturates), and infants up to 6 weeks after birth who experienced in utero exposure to cannabis. On the basis of the previously published protocol,6 studies with the following maternal outcomes were included: pre-eclampsia, eclampsia, postpartum depression, spontaneous delivery, retained placenta, abruption placenta, placenta accrete, placenta previa, postpartum haemorrhage, anaemia, uterine inversion, uterine rupture, vasa previa, oligohydramnios, polyhydramnios, maternal mortality, morning sickness, neonatal nursing, abnormal labour and prenatal care. Fetal outcomes included:6 preterm birth (PTB), intrauterine growth restriction, head circumference, infant birth weight, low birth weight (LBW) (<2500 g), gestational age, fetal length, fetal movement, fetal organ maturity, fetal viability, Apgar score and other neonatal assessments, neonatal intensive care unit or intensive care unit stay (NICU/ICU), days in the hospital, reported neonatal problem such as distress, jaundice, spontaneous abortion, neonatal mortality and resuscitation. Two reviewers (JKLG and KEC) independently screened titles and abstracts of identified studies to assess their eligibility for inclusion in the review, using an eligibility form based on the study protocol.6 Titles and abstracts were first reviewed and duplicates were removed. The reviewers obtained full copies of potentially eligible articles and assessed them independently to determine which articles met the predetermined inclusion criteria. Where there were uncertainties regarding eligibility of studies, all reviewers participated in the inclusion decision (figure 1). Flow of studies through the review process. ICU, intensive care unit; NICU, neonatal intensive care unit. Data from eligible studies were independently extracted by two reviewers (JKLG and SJG), and differences were resolved by discussion and consultation with a third reviewer (JEE). A predesigned data abstraction form was used to extract relevant information. Data extracted from each study included: name of first author, year of publication, study design, location and time of data gathering, participants’ demographics, if use of cannabis was self-reported or biologically measured, sample size, variables of interest related to maternal and infant outcomes, study findings, and methods for management of confounding variables. Because studies that focus on use of cannabis during pregnancy often come from a variety of disciplines, OR/risk ratios, mean differences, p values of models, and percentages were extracted. Two authors independently assessed the quality of selected studies using predetermined quality assessment criteria (see online supplement 2). For cross-sectional studies, the National Collaborating Centre for Environmental Health's tool Critical appraisal of cross-sectional studies was used to assess the risk of bias.7 This tool includes the assessment of study content, method of determining exposure status, comparability of the exposed versus non-exposed group, validation of outcome measures and generalisability. We assigned a composite quality score of 0 (low) to 4 (high). For cohort studies, the Critical Appraisal Skills Programme's Making sense of evidence was used to assess the risk of bias.8 This tool includes an assessment of recruitment procedures, measurement of exposure, confounding factors, study results and generalisability. We assigned a composite quality score of 0 (low) to 8 (high). For case–control studies, the Critical Appraisal Skills Programme's Making sense of evidence was used to assess the risk of bias.9 This tool uses three broad categories to address study validity, methodology, recruitment styles and appropriateness, validation of exposure status and measurements, confounding variables and study outcome. We assigned a composite quality score of 0 (low) to 10 (high). No randomised trials were found. Heterogeneity was assessed using the Q test10 and the I2 statistic (I2=100%×(Q−df)/Q).11 To assess the Q test, a p value of 0.10 or less was considered statistically significant as this value indicates heterogeneity among studies. For studies with a p value ≤0.10, I2 was calculated. When using the I2, heterogeneity levels of ≤50% were deemed acceptable. Because of the limited number of articles that met the inclusion criteria for meta-analysis, a subgroup analysis when heterogeneity was more than 50% could not be conducted. 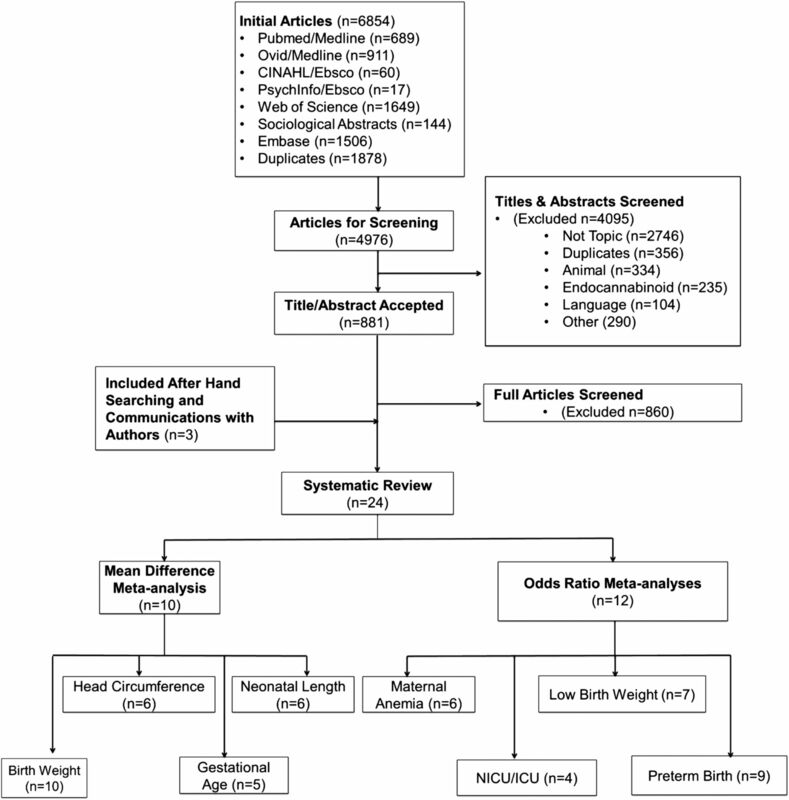 The continuous variables used for this meta-analysis include: birth weight (g), gestational age (weeks), length of neonate (cm) and head circumference (cm). All variables were measured on infant delivery. The initial search results yielded 6854 articles of which 1878 duplicates were found (see figure 1). Of the 4976 unique articles screened, 4095 were excluded based on the abstract or title. In total, 881 full articles were screened, of which 2413 ,16–22 ,24–39 articles, representing 19 unique studies,13 ,16–22 ,24–29 ,31 ,36–39 met the inclusion criteria. Ten studies were conducted in the USA13 ,20 ,22 ,24 ,25 ,27 ,28 ,36 ,38 ,39 five in Canada,31–35 three in Australia16 ,18 ,21 two in The Netherlands29 ,30 and one from each of the following locations: Iran,17 Jamaica,37 Spain,19 and Brazil26 (see online supplement 3). The search did not yield any randomised controlled trials. The studies were comprised of 1 cross-sectional,26 1 case–control38 and 22 cohort studies.13 ,16–22 ,24 ,25 ,27–29,31–37 ,39 ,40 The quality assessment of the studies indicated high study quality (see online supplement 2). As shown in online supplement 3, birth weight was reported as a continuous variable in 10 studies.17 ,19 ,21 ,22 ,26 ,28 ,29 ,31 ,37 ,39 Four of these studies showed a decrease in fetal weight when exposed to cannabis in utero,21 ,22 ,28 ,29 while six reported a null association.17 ,19 ,26 ,31 ,37 ,39 The random-effects model showed a significant reduction in birth weight of 109.42 g (95% CI 38.72 to 180.12, I2=63%) for infants exposed to cannabis in utero compared with those who were not exposed (see online supplement 4, Forest Plot 2). LBW was reported in seven studies.13 ,15 ,16 ,18 ,20 ,22 ,24 ,36 Two studies showed an increase in the odds of having an LBW infant when exposed to cannabis in utero;16 ,18 five studies reported a null association.13 ,20 ,22 ,24 ,36 The random-effects model demonstrated higher odds of LBW in infants’ exposure to cannabis in utero compared with those who were not exposed to cannabis in utero (pOR 1.77: 1.04 to 3.01, I2=89%) (see online supplement 4, Forest Plot 3). Medical and social use of cannabis is rapidly becoming more acceptable in the USA and around the world.2 ,41 The effects of in utero exposure to other illicit drugs, such as cocaine, have been widely studied. Less is known about the effects of cannabis on fetal growth and development, or its effects on pregnant women. This systematic review summarised and critically appraised the existing literature on the effects of prenatal exposure to cannabis on women and their neonates. This meta-analysis demonstrated that women who used cannabis during pregnancy had an increase in the odds of anaemia compared with women who did not use cannabis during pregnancy. Infants exposed to cannabis in utero had a decrease in birth weight compared with infants whose mothers did not use cannabis during pregnancy. Infants exposed to cannabis in utero were also more likely to need placement in the NICU/ICU compared with infants whose mothers avoided using cannabis during pregnancy. Overall, very few studies reported overlapping maternal outcomes. Anaemia was the most widely discussed maternal outcome in the cannabis-pregnancy literature. This was not surprising, as anaemia is part of the screening panels during prenatal care in most countries. Only one of six showed an increase in the odds of having anaemia in mothers who used cannabis during pregnancy compared with those who did not use cannabis during pregnancy. However, with a sample size of 8350, this study had the largest sample size of all the studies in this review, and accounted for the greatest weight in the meta-analysis.22 More research is needed to determine whether there is any association between maternal anaemia and use of cannabis during pregnancy. Therefore, it is recommended that these study results be interpreted with caution until future studies are completed. Results from this systematic review also indicated that very few studies showed any association, negative or positive, between use of cannabis during pregnancy and adverse maternal outcomes. Because few studies reported overlapping maternal outcomes, the effects of exposure to cannabis on maternal outcomes will remain unclear until more studies are completed. This meta-analysis demonstrated that the outcome of an infant exposed to cannabis in utero results in low birth weight when measured both as a dichotomous and continuous variable. LBW is associated with an increase in morbidity and mortality in infants.42 ,43 Long-lasting negative consequences of LBW include: neurosensory impairments;44 ,45 decrease in height;44 ,45 decreased IQ and educational achievement;44 ,45 and increased psychopathology.46 Educating women and physicians on the possible risks associated between lower birth weight and in utero exposure to cannabis is warranted. Infants exposed to cannabis in utero had an increased placement in the NICU/ICU. Costs associated with the NICU are among the highest in healthcare, in and outside the USA.47–50 As this was demonstrated in three16–18 of four24 studies, it warrants further attention by doctors and policymakers alike. The effects of in utero exposure to cannabis on fetal growth parameters and other fetal outcomes—that is, gestational age, length, head circumference—were not demonstrated in the meta-analysis. However, because the results of all growth parameters remained fairly inconsistent in the literature, more studies are needed to determine the association between use of cannabis and fetal growth parameters. The effects of use of cannabis on neonatal assessments were rarely discussed in the literature. Apgar score was the most discussed neonatal assessment; no significant associations were demonstrated between in utero exposure to cannabis and Apgar scores. Results of other neonatal assessments, such as the NBAS or Prechtl, were rarely discussed in the literature and warrant further attention. This systematic review and meta-analysis are not without limitations. There remains a gap in the literature assessing the effects of cannabis excluding other illicit drug use. As use of cannabis gains social and medical acceptance, understanding its effects on maternal and fetal outcomes remains essential. As many cannabis users are often tobacco or alcohol users, determining a cannabis-only effect (excluding the presence of tobacco and alcohol) was currently not possible in this systematic review and meta-analysis with the available literature.51 It is well established that both tobacco and heavy alcohol use increase adverse fetal outcomes such as LBW, PTB and being small for gestational age,52 ,53 therefore, it is unknown if the effects found in this manuscript are related to cannabis or are a by-product of alcohol and tobacco use. Controlling for potential confounding variables is essential to understanding any relationship. Because studying the relationship between cannabis and maternal and fetal outcomes is fairly recent, future research needs to take confounding and utilisation of appropriate control groups into consideration. Also, numerous articles reported unique maternal and fetal outcomes not reported in other studies; therefore, definitive conclusions could not be drawn. Moreover, very few outcomes were measured in standardised methods. Maternal anaemia, PTB and LBW all have standard cut-offs that are used for clinical practice. Although these outcomes were all frequently reported in the literature, few studies defined them in their manuscripts. Furthermore, reliance on self-reported measures of use of cannabis, may have underestimated the prevalence of drug use during pregnancy due to social desirability. More studies that assess drug use using biological screening panels along with self-report measures are needed to estimate self-report bias. Lastly, studies often failed to report maternal age, or only have a mean and SD. Therefore, the authors of the current manuscript were not able to restrict this systematic review and meta-analysis by maternal age. There was an initial attempt to restrict our inclusion criteria to women 18 years or older; however, the search results did not yield enough studies to warrant this age restriction. By conclusion, the effects of cannabis on maternal and fetal outcomes remain generally unknown. Results from this systematic review and meta-analysis demonstrated that future research in the area of cannabis and maternal and fetal health needs to employ stricter inclusion criteria and exclude polyillicit substance use. There does appear to be negative consequences associated with in utero exposure to cannabis, including decrease in birth weight and a need for placement in the NICU/ICU. However, more research is needed to further assess these relationships in more homogeneous populations. Pregnant women could benefit from health education on the potential adverse effects of use of cannabis during pregnancy. As use of cannabis continues to become socially acceptable in many countries, understanding the effects on maternal and fetal health should become a global priority. Board, I.N.C, U.N.V.I. Centre, and Austria. International Narcotics Control Board: 2013 Annual Report, 2013.
Review Manager (RevMan). 2014, Copenhagen: The Nordic Cochrane Centre, The Cochrane Collaboration.
. Effects of marijuana on human pregnancy, labor, and delivery. Neurobehav Toxicol Teratol 1982;4:447–50.
. Low birthweight: country, regional and global estimates. UNICEF, 2004.
. Maternal and neonatal complications of substance abuse in Iranian pregnant women. Acta Med Iran 2012;50:411–16.
. The impact of continuing illegal drug use on teenage pregnancy outcomes—a prospective cohort study. BJOG 2002;109:1148–53. [No authors listed]. WHO: recommended definitions, terminology and format for statistical tables related to the perinatal period and use of a new certificate for cause of perinatal deaths. Modifications recommended by FIGO as amended October 14, 1976. Acta Obstet Gynecol Scand 1977;56:247–53.
. Cocaine/polydrug use in pregnancy: two-year follow-up. Pediatrics 1992;89:284–9.
. Marijuana use during pregnancy: consequences for the offspring. Semin Perinatol 1991;15:280–7.
. Marijuana use during pregnancy and perinatal risk factors. Am J Obstet Gynecol 1983;146:992–4.
. From the cradle to the labor market? The effect of birth weight on adult outcomes. National Bureau of Economic Research, 2005.
. The cost analysis of preterm infants from a NICU of a state hospital in Istanbul. Iran J Pediatr 2012;22:185. Contributors CBR and JEE conceived the idea for the study and oversaw all aspects of protocol development and final review. JKLG and AN made substantial contributions to the conception and design of the project. SJG and KEC assisted in the logistics of data collection. CC edited and commented on drafts of the manuscript. All authors were involved in manuscript preparation.